One of the nation’s newest hustles is line sitting, and the concept is simple. People hire professionals to wait in line for them — then switch spots once the sitter reaches the front. That’s it. The sitter makes easy money; the person doing the hiring saves time and gets quick access. Jennifer Goff is the founder and CEO of Skip the Line. Her venture started in June 2017 when a Game of Thrones pop-up bar debuted in Washington, D.C. Fans turned out in force and Goff took notice of the huge lines of people waiting for hours to get in. “Before I had a business plan, it was a way to make extra money,” she says. She would approach people in line and say, “I’m here if you want me to wait. You can go get a drink or food.” She uses text messages and photos to inform them as the line moves closer to its goal. 1. DESCRIBE THE TASK. Choose from a variety of home services and select the day and time you'd like a qualified sitter to show up. Provide the details and they'll find you the help. 2. GET MATCHED. Select from a list of qualified and fully vetted sitters for the job. Choose sitters by their hourly rate and start chatting with them right in the app. 3. GET IT DONE. Just like that, your line sitter arrives and gets the job done. When your task is complete, payment happens seamlessly and securely through the app. 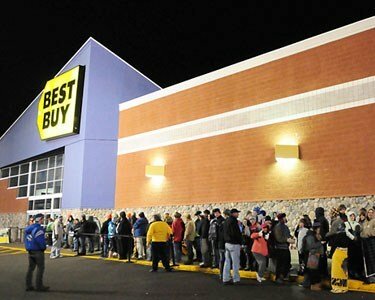 After a night of camping outside of Best Buy, people line up for Black Friday sales. At first glance the service seems self indulgent and utterly absurd, but that doesn’t mean it won’t succeed. I thought Starbucks’ business model was destined to fail. Remember when we made our breakfast coffee at home, and businesses had coffee stations available to employees? I questioned why anyone would go outside and wait in line for coffee. I was wrong then and I may be just as wrong now. I admire the creativity of new industries that fill an unmet need: fingertip computers in the form of cell phones; digital shopping malls like Amazon and Wish; door to door transportation like Uber and Lyft; and instant banking. They introduce us to conveniences we learn to want. They also provide jobs we desperately need.